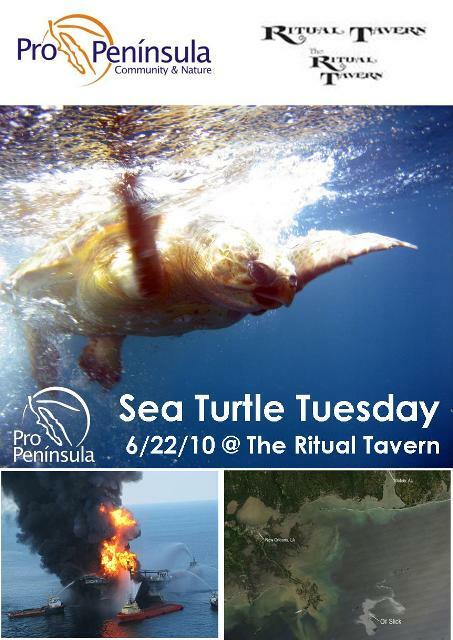 The Ritual Tavern, located on the corner of 30th/Polk Ave in North Park, has partnered up with Pro Peninsula to fundraise towards sea turtle conservation in the Gulf of Mexico. of their proceeds to The Sea Turtle Fund. The Sea Turtle Fund is a fund within The Ocean Foundation in which all donations made during June - August 2010 will be directed towards conservation efforts related to recovering sea turtles harmed by the oil spill. On behalf of Pro Peninsula & The Ritual Tavern, we invite you to come enjoy delicious food and drinks... knowing that at least a 1/4 of your check will support a very important cause! - Contact gigi@propeninsula.org for questions.